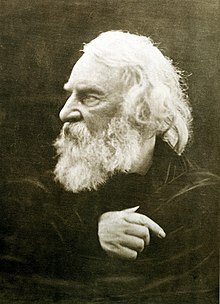 Henry Wadsworth Longfellow (Februar 27, 1807 – Mairch 24, 1882) wis an American poet an eddicator that's warks include "Paul Revere's Ride", The Song of Hiawatha, an Evangeline. He wis an aw the first American tae translate Dante Alighieri's Divine Comedy an wis ane o the five Fireside Poets frae New Ingland. This page wis last eeditit on 24 Apryle 2018, at 01:32.